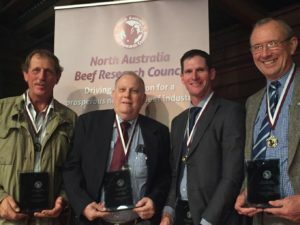 The winners of the 2016 North Australia Beef Research Council (NABRC) Medals were announced in Rockhampton in August at the Northern Beef Research Update Conference presentation dinner. From left to right: Producer: Keith Holzwart, Avago Station, Daly Waters, NT; Researcher/Scientist: Dr Brian Burns, Senior Principal Scientist, DAF Rockhampton; Young Achiever: Ashley Kirk, Rockley Brahmans, Bajool Qld and Communicator/Extension: Ken Murphy, Senior Industry Development Officer, DAF Rockhampton. “The NABRC Medals highlight achievements of people for excellence in the fields of production, research and development and communication in North Australia, and Keith, Brian, Ashley and Ken are indeed extremely worthy recipients,” NABRC chairman Dr Fitzpatrick said. Dr Burns, a University of Queensland Senior Research Fellow, has contributed to the northern cattle industry through more than 30 years’ work in the fields of beef cattle genetics, genomics, epigenetics, animal breeding and reproduction. Dr Lee Fitzpatrick said Dr Burns was a fitting recipient, having an outstanding reputation among scientists and producers for quality scientific research.